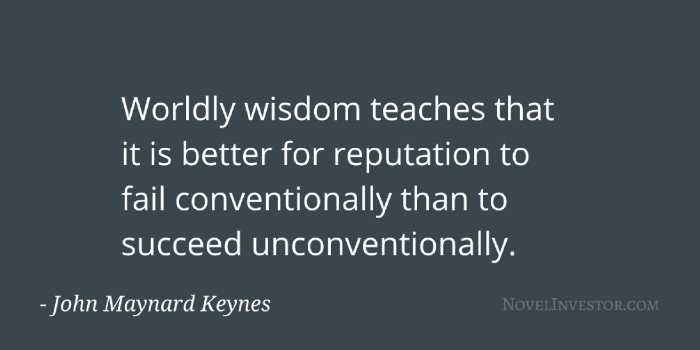 John Maynard Keynes is one of the most well-known economists ever. It turns out he had some insights about markets and human nature too. Keynes laid out his views in Chapter 12 of The General Theory of Employment, Interest, and Money. I read Chapter 12 recently. It offers a densely packed introduction to the headwinds of long-term investing. Like, Ben Graham, Keynes believed that investing has more to do with managing yourself than your money. He understood that the advantages market’s offered often brought out some of the worst in investors. Not surprising, they both chalk it up to being drawn toward speculation. Not much has changed in the 81 years since he wrote it. I wanted to highlight a few bits of his wisdom from Chapter 12. First, Keynes offers the reminder that it’s a market of businesses not pieces of paper. But the Stock Exchange revalues many investments every day and the revaluations give a frequent opportunity to the individual (though not to the community as a whole) to revise his commitments. It is as though a farmer, having tapped his barometer after breakfast, could decide to remove his capital from the farming business between 10 and 11 in the morning and reconsider whether he should return to it later in the week. Day-to-day fluctuations in the profits of existing investments, which are obviously of an ephemeral and non-significant character, tend to have an altogether excessive, and even an absurd, influence on the market. Stock prices swing widely and wildly at times, sometimes for no rational reason, so you might as well be prepared for it. A conventional valuation which is established as the outcome of the mass psychology of a large number of ignorant individuals is liable to change violently as the result of a sudden fluctuation of opinion due to factors which do not really make much difference to the prospective yield…In abnormal times in particular…the market will be subject to waves of optimistic and pessimistic sentiment, which are unreasoning and yet in a sense legitimate where no solid basis exists for a reasonable calculation. The biggest short term driver of stock prices is due to speculators guessing what long-term investors are willing to pay next month. …the energies and skill of the professional investor and speculator are mainly occupied otherwise. For most of these persons are, in fact, largely concerned…with foreseeing changes in the conventional basis of valuation a short time ahead of the general public. They are concerned, not with what an investment is really worth to a man who buys it “for keeps”, but with what the market will value it at, under the influence of mass psychology, three months or a year hence…For it is not sensible to pay 25 for an investment of which you believe the prospective yield to justify a value of 30, if you also believe that the market will value it at 20 three months hence. Speculation puts the emphasis on speed. To be right and make money, you need to get there first. Short-termism at it’s best. The social object of skilled investment should be to defeat the dark forces of time and ignorance which envelop our future. The actual, private object of the most skilled investment to-day is “to beat the gun”, as the Americans so well express it, to outwit the crowd, and to pass the bad, or depreciating, half-crown to the other fellow. Investing successfully is the difference between action and inaction. Action is easy. Inaction is difficult…boring…but ultimately profitable. Career risk is ever present for those managing other people’s money. Being different in the short term might mean not being around to see success later on. Finally it is the long-term investor, he who most promotes the public interest, who will in practice come in for most criticism, wherever investment funds are managed by committees or boards or banks. For it is in the essence of his behaviour that he should be eccentric, unconventional and rash in the eyes of average opinion. If he is successful, that will only confirm the general belief in his rashness; and if in the short run he is unsuccessful, which is very likely, he will not receive much mercy. Worldly wisdom teaches that it is better for reputation to fail conventionally than to succeed unconventionally. There is always some level of speculation in stock prices. That’s okay. But when gambling is the primary influence on prices, watch out. If I may be allowed to appropriate the term speculation for the activity of forecasting the psychology of the market, and the term enterprise for the activity of forecasting the prospective yield of assets over their whole life, it is by no means always the case that speculation predominates over enterprise. As the organisation of investment markets improves, the risk of the predominance of speculation does, however, increase. Keynes explains that speculation is a result of “liquidity.” While most people saw market liquidity as a huge benefit, Keynes saw it as a double edged sword. The ability to easily buy and sell assets has a downside. Easier buying and selling makes it easier to speculate. It promotes action. And the dominoes fall from there. Businesses get treated like pieces of paper. Investors start to guess where prices will be in a month. Price disconnects from value. And Mr. Market is in full effect. It’s a game few can play, so why bother.